A few days ago I had written to a potential German cousin. I got the reply and was invited to join their site. I have yet to figure out the relationship but I think perhaps first cousins twice or three times removed. 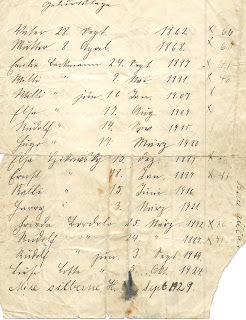 In some areas I had more information than she, BUT.......I have learned the names of my great great grandparents........She did not have posted the names of the other sisters children but I did find out the years that my great aunts had died. I have a little more to fill in on my chart. I am back for vacation and was checking my email when one of my accounts had a message. It was one of those "we found a match" notifications. I was amazed the names the person had were also the names of my grandfather Willi Schridde sisters. My theory is this quite possibly could be a person descended from one of Willi's sisters. 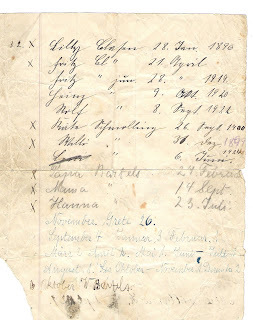 The birth dates were the same that I had found on my great grandmothers Gerburtstag list. I send her, I am thinking the person is a female, a note and explained who I was.. I hope they reply because there could be a lot of information that we could share. I HOPE HOPE HOPE they will reply. They live in Germany and with Google translate we could correspond. I do hope they will get back to me. A few weeks ago I had posted the old Army tent and talked about my first trip to the beach. Well here is where we stayed this time. It is a two bedroom condo in Corolla NC. Has a nice kitchen, family-dining room, two bathrooms, and a laundry room. Has a lot of room for a condo and off the deck you can see the sound and the ocean. The best part is no bugs and A/C and I can't say that about the tent. Things have been slow here in the Genealogy Department. I guess everyone needs a break once in a while. The only thing I have done was to go to a Genealogy Book Sale. I bought about six books, most of them relating to Ireland and Germany. I did find the RED BOOK. I had heard of it and took it while the other were madly searching. They are all in the trunk of my car waiting for me to check them and see if anything is of any use The total cost was $13.00 and to top it off I got a cookie. The society has a meeting every second Saturday and that was the feature of that meeting. What happened was that there was a guy who was taking every book in sight and piling them in boxes. He had an accomplice guarding his booty. The only thing I could think of was that he perhaps had a store and was buying them for resale. I was disappointed by that because I felt that there might have been some that I could have used. The books seemed to be from the library collection and some of them were very old. Charles Forgie is a person whom I have yet to research. My grandmother Gertrude O'ROURKE Dowd had a sister named Anna O'Rourke. Anna was 18 years older than Gertrude. Anna was first married to Charles Forgie, It appears that her first husband, Charles, died at an early age. She next married Peter Zentner. 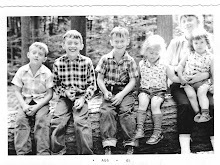 They had five children, Leo, William, Mary, Ellen and Rita. Peter also died at an early age. After Peters death (don't know when) Anna married James Clougherty. There were no children from that marriage. Below is the tombstone for Anna's son Charles. He would be my first cousin once removed, and is buried near his mother Anna, also pictured below. I think that Richard Davis was a grandson. Possibly the child of her daughter Mary Zentner Davis. Anna is buried with husband number two, but where is Charles Forgie and my theory is James Clougherty is buried with his first wife. Well, better late than never. At least as long as posting goes. I did not find any of my family on Find A Grave. So, there are a lot there now. I spent the better part of three hours just adding my immediate family. 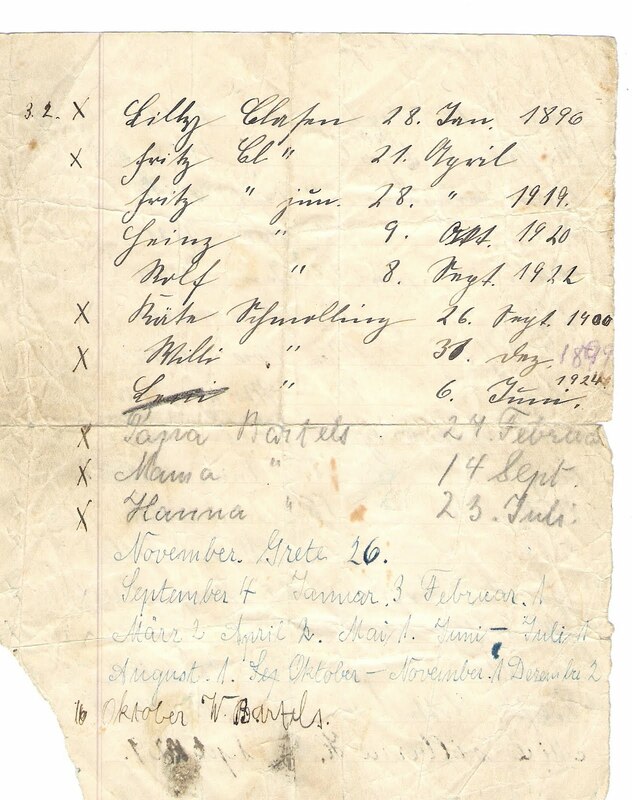 I did add the sisters of my great grandfather, Daniel Mathias Zacharias Bartels. 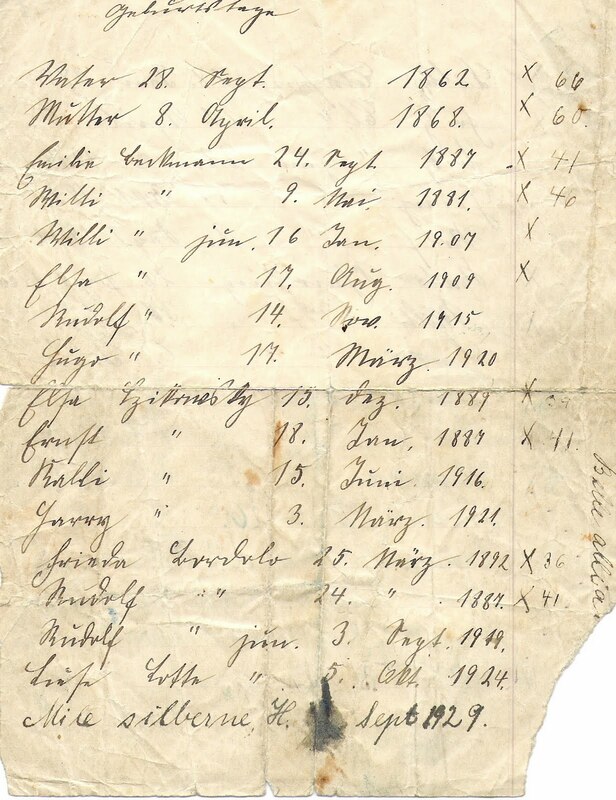 Looks like about five of the siblings emigrated to Pennsylvania and Daniel stayed in Germany. I am hoping that perhaps some cousin will find them and write to me. It has happened before. Now that my fingers are exhausted from typing, I will finish for today. Accommodations on the first trip to the Outer Banks of North Carolina. The sibs and I still go but we are staying in air conditioned houses and condos now.